An aged cream finish gives this canister set a classic look. Each canister has a brown lid and features its own content label. 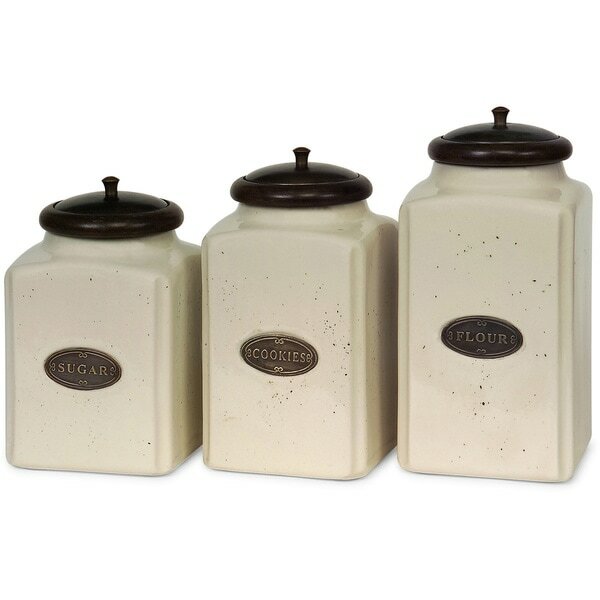 For storing your sugar, cookies and flour, this set of ceramic canisters is perfect..
Great canister set. Snug seal. This canister set is as advertised. The opening is a bit smaller that I would like, but manageable. Wish it had one more size to make a total of 4. I would definitely recommend this to a friend. I found great use out of the product as it was inteded. I gave it as many stars as I did because I found no issue with the product. If it doesn't work as expected. I will look for a refund. There are no issues at this time though. I feel it is made of quality materials as I don't see any imperfections at this time. IF there are any that arise, I will rereview this product. I hope this helps someone in their purchasing decisions. If the product is damaged or ends up not working as expected, Overstock has an excellent return policy. Love these canisters. They go great with a Tuscan style kitchen. Only issue is the opening is kind of small otherwise I would give a 5. Overall quality product. As pictured. Well made, looks great. Don't use it to store the named items but who will know. Adds a clean, classy perfect finishing touch to the kitchen counter space. Perfect for my new kitchen! These look great in my newly remodeled kitchen. The opening is smaller than my old canisters but I'm still very happy with my purchase! Very nice in our new kitchen and the seals are quite tight, which I love. Beautiful set. Very sturdy, made very well. No issues on arrival. Beautifully displayed on my granite counters. Nice. Beautiful. Right size, not overbearing. These are very nice... not completely airtight, but close enough. Also there is some sort of 'antique' spray of dark dots that adds some character, but on the ones I received the dots are very inconsistent... almost making them look dirty in areas. All told, a very good value for what you get, and I would order them again. "can measuring cups fit into the canesters"
Yes, the measuring cups can fit into the canisters. "will a I cup measuring cup fit in these"
Yes, a mensuring cup will fit into these. "Is there another smaller canister size available in this style? I need 4 pieces and this set only has 3 "
"I just can't seem to get rid of the smell that came with them. Even after soaking them in vinegar and water and running them through the dishwasher, I literally can't put anything in them....the smell is awful! Ideas?" Hello OstkUser85531, you will be contacted by Customer Care for further assistance with your issue. Have a great day. I have the same issue and it effects the contents of the canister as well. Have tried soaking etc. what did you do? I want to order these, but this question worries me. Were you able to resolve it?? "Can you turn these around so the labels don't show and get the same look on the back?" Hello Betty W., there are no labels on the back and they have the same finish. Have a great day! I'm moving to a new home, and was looking for a canister set that fits the new decor. These canisters are a little larger than others that I looked at - I was looking for this larger size. Also, the attractive color...matches perfectly with what I was searching for. A little spendy, though! "Does this set have airtight seals inlids?" Hello Sunshine, this lovely set does offer sealed airtight lids. Thank you for shopping with us.